Now since we here at WOBH always give you the very best we tracked down this digital comic series which stars a reporter who is chasing her own story and a covert agent accused of going rogue at the center of a CIA cover up that will have far reaching implications for America and the world!! Get your free legal copies of #1 and #2 here before the release of the recently announced Graphic novel! Agent HITLESS finds himself the target of a setup when his first mission goes awry resulting in a trail of collateral damage. Labeled a rogue CIA Agent, HITLESS quickly finds himself alone and on the run, targeted for termination by an employer and his assassins who will stop at nothing to silence him from revealing the truth. The only person who can help prove his innocence and bring the real conspirators to justice is a young journalist assigned to investigate the botched CIA mission whose hidden past secretly links her to the project. 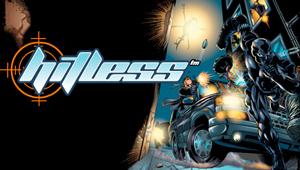 Join the official HITLESS facebook Page and stay up to date on the latest happenings with agent HITLESS! Hitless stems from the creative mind of Nicholas Da Silva and Zoolook!!!. ← New York Comic Con 2010!